So the measurment of a galaxy's redshift givers you an estimate of that galaxy's distance --- thus allowing astronomers to map the nearby Universe. The second CfA survey (CfA2) was started by John Huchra and Margaret Geller in the winter of 1984/5. Between 1985 and 1995, we and our students and co-workers measured relative distances via redshifts for about 18,000 bright galaxies in the northern sky. Here's a plot of the sky distribution of the galaxies in the CfA Redshift Survey (J. Huchra and M. Geller 1998). Each point represents a galaxy in the northern celestial hemisphere that is brighter than an apparent blue magnitude of 15.5 and with a measured redshift inside 15,000 km/s. The nearest galaxies are shown in red, followed by blue, magenta, cyan and green. The first slice of the CfA Survey. Redshift surveys are ways of mapping the distribution of galaxies around us. We use redshift as the measure of the radial coordinate in a spherical coordinate system centered on the Milky Way. Below is the "slice of the Universe" that represents the first set of observations done for the CfA Redshift Survey in 1985 by Valerie de Lapparent, Margaret Geller and myself. These are spectroscopic observations of about 1100 galaxies in a strip on the sky 6 degrees wide and about 130 degrees long. We are at the apex of the wedge. The radial coordinate is redshift, measured in kilometers per second, with the current best conversion (see ``Hubble Constant'' below) of about 20 kilometers per second per million light years. That means the outer arc of the plot is at a distance of about 700 million light years. The angular coordinate is the right ascension, or the celestial equivalent of longitude. This initial map was quite surprising, showing that the distribution of galaxies in space was anything but random, with galaxies actually appearing to be distributed on surfaces, almost bubble like, surrounding large empty regions, or ``voids.'' You can get a clean postscript version of this figure here . If you use this or any other image from this site, please credit the Smithsonian Astrophysical Observatory and the appropriate authors. The Great Wall itself can be viewed in this simple planar projection of all galaxies in the CfA Survey with velocities between 6,500 and 11,500 km/s in the north galactic cap. Galaxies with velocities between 6,500 and 8,500 km/s are plotted as red points and those between 8,500 and 11,500 are blue. Because the Great Wall is slightly tilted in velocity space (see the previous figure), the higher velocity end dominates the eastern portion of the figure. The Great Wall is a surface that has, as expected, considerable two-dimensional structure --- embedded clusters and groups of galaxies as well as some filaments and other, more amorphous structures - basically both low and high density regions (see, for example, Ramella, Geller and Huchra ApJ 384, 404, 1992). The Coma Cluster is the dense region right near the center of the plot (13h and +29d). 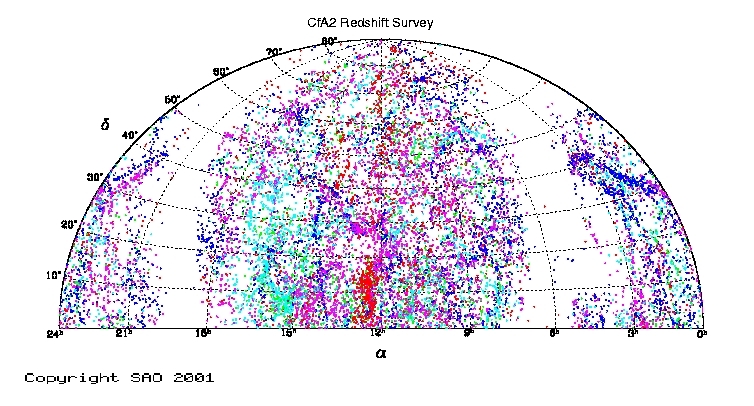 The redshift distribution of the CfA2 survey can also be seen in this polar projection of the redshifts for all the galaxies in the CfA2 survey out to 12,000 km/s. This is a section of a cylinder in equatorial coordinates looking down from the north pole to the equator with a height of 12,000 km/s and a radius of 12,000 km/s. Tha major structures seen are again the Local Superluster just above the middle of the plot, the Great Wall cutting from 9 hours and 5,500 km/s to 15 hours and 9,000 km/s and the Pisces-Perseus supercluster centered around 1 hor and 4,000 km/s. The geometry of this projection is similar to that of a hockey puck. The combination of several new surveys also provides a new view of the Local Supercluster. The above plot shows the all-sky distribution of all the galaxies in ZCAT with heliocentric velocities less than 3000 km/s. This set is essentially made up of objects fromt he CfA Survey in the north, the SSRS2 survey in the south, the ORS survey in regions not covered by the others plus the IRAS 1.2-Jy survey all over, especially at low galactic latitudes (the small points sprinkled throughout the map). Despite the poor coverage at low galactic latitudes, the LSC and the central regions around its core, the Virgo Cluster, stand out quite dramatically. To give you some idea of the statistical characteristics of the CfA2 catalog, these two plots show the count statistics (log N - log S) and the V/Vm statitics for the CfA2 catalog above |b| = 30 degrees log(n)-log(s) , V/Vm . For a uniform distribution in Euclidean space, V/Vm shoul ve 0.50. These plots show first, an excess of brighter galaxies relative to a normalization at m_pg=13.5, which has long been associated with the presence of the local supercluster, and second, an apparent slight excess below 15th magnitude that may be associated with the Great Wall. Note that the plots are both integral statistics (its difficult to define V/Vm for differential counts!) Part of the excess at faint magnitudes may also be due to nonlinearities in the Zwicky-Nilson magnitude scale (e.g. Huchra 1976, AJ 81, 952 and many following references). The luminosity function for the catalog (a measure of the selection function), calculated using the simple V/Vm method (Schmidt 1968; Huchra & Sargent 1973), is given in log phi , where phi is the number density of galaxies per luminosity interval, i.e. the number of galaxies per magnitude interval per cubic Megaparsec. This is computed for a an area of the sky given by the boundaries (0-90d, 8h-17h, -2.5-90d, 20h-4h), which covers 36.15% of the sky, and assumes a Virgo infall of 250 km/s, H_0=75 km/s/Mpc, and an extinction correction of 0.15csc(b). There are 13,977 galaxies in this subset catalog. It is necessary to download the file via ftp because of its size. There is a README file describing the data stored there available for public use, sources for redshifts etc. and information about how to reference these if you do use them. The compressed public version of the CfA Redshift Catalogue is in "velocity.dat.gz". There are also files for the CfA1 survey data (cfa1.dat), the published CfA2 slices, and subdirectories for the IRAS 1.2 Jy sample, the UZC, the ORS and many other available redshift surveys. The last update of this file is from April 20 of 2005. Questions about sources should be addressed to J. Huchra. If you have published a paper or database that is *not* in our list, please let me know wo we can include it! Nowadays, most of the actual templates used are synthetic and can be obtained from Doug Mink or Mike Kurtz of the SAO Telescope Data Center. If you have questions about the use of the Catalogue or anything else here please contact me at the e-mail address below. I won't promise a prompt response but I will promise a curteous one! Nathalie Martimbeu (nmartimb@cfa.harvard.edu) is also responsible for corrections and information, and, if you don't get me try her.